The title of this recipe does not do the final result justice. This Avocado Appetizer is simple and packed with flavor all at once. I know it's hard to believe, but the first time we tried it in Hawaii we were taken back at the complex flavors in such a seemingly simple dish. We knew we had to recreate it! I think we were most impressed by the fact that the avocados had been out all day and not even slightly browned. We knew this would make the perfect appetizer for any event or even a day long party! This Is The Best Avocado Recipe You Will Ever Make! It's simple, delicious, low maintenance and high fat. Does a keto recipe get any better? Not to mention all the spice in every bite. The hardest part about this recipe is probably finding a perfectly ripe avocado. 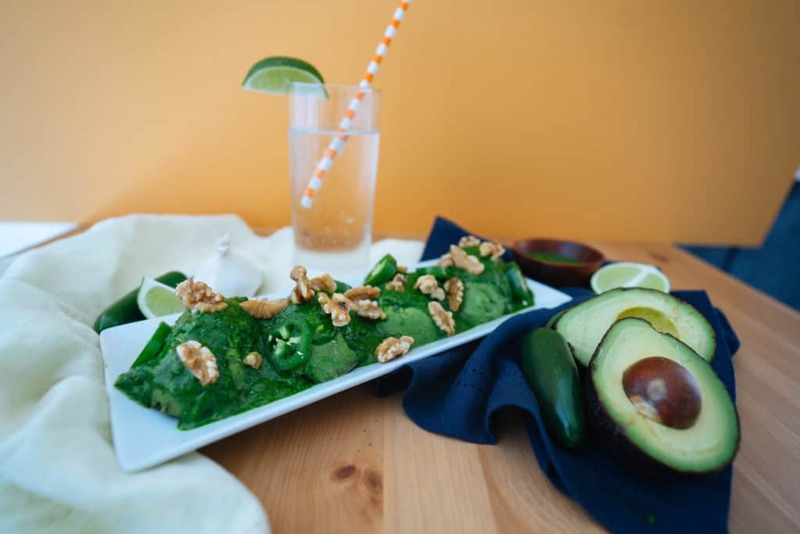 The rest of the recipe requires blending ingredients, topping the avocado and enjoying your new favorite avocado appetizer. If you aren't sold then we haven't done our job, meaning we guarantee you you will fall in love instantly with the first bite. Appetizers are one of my favorite types of foods. If eating small bites of several different things was possible for all my meals I would live the rest of life like that. Attending a party or gathering you know the staples are going to be there - chips, fruit, some sort of salad, whether it be an actual salad with dressing or an egg/potato salad, and guacamole, but why be predictable when you can impress the partiers with this avocado appetizer. If you think this is too posh we've got you covered with some of our other favorites, like our bacon jalapeño poppers, buffalo chicken dip, or pizza dip. When Matt and I had this in Hawaii we ate it along side rotisserie duck so not only does it make for a great appetizer, but also a side dish! Make this for your next family dinner or party and let the compliments roll in. It may seem weird at first, but avocado is one of the most normal foods on a keto diet - this just takes it to the next level. 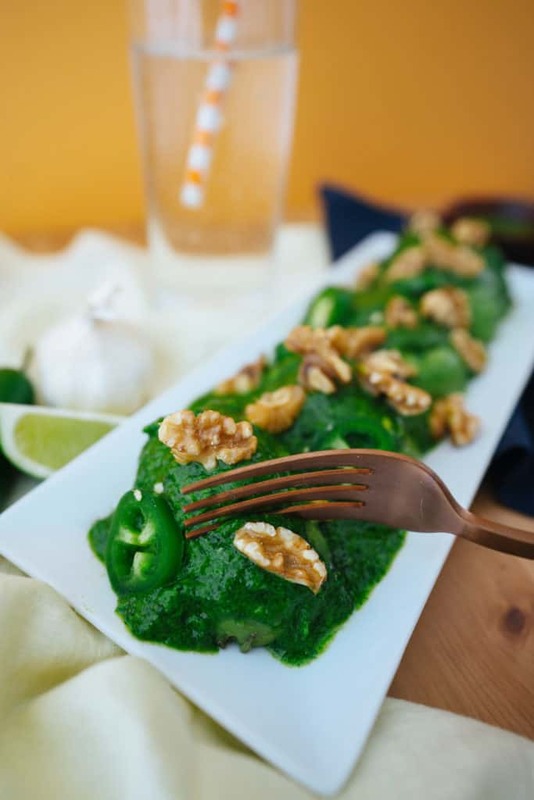 You can even dress it up differently instead of just crushed walnuts and jalapenos like we did. If you're an avocado lover, you'll love this avocado appetizer. 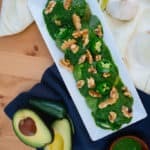 Recipe can be quickly added to MyFitnessPal - Search "KetoConnect - Keto Avocado Appetizer"
Add all the dressing ingredients into a blend and pulse until combined, but still slightly chunky. Taste to make sure it is seasoned enough and then set aside if done. Slice the avocados in half and peel the outer skin. Lay them seed side down on a plate. Pour the dressing over the avocados coating them entirely. Garnish with sliced jalapenos and crushed walnuts, if desired. Enjoy! Note: Will store well in the fridge up to 12 hours if covered with saran wrap.